The latest iPhone, iPod Touch, and iPad app to make us think “WTF” is the iScab game app. As a mom who reminds someone daily not to pick a scab, I am mystified by anyone who thinks it would be fun to pick virtual scabs as well. The iScab iPhone app has a fairly simple premise. You fill a scab jar to earn points and esteem on the iScab Leaderboard. Luckily, you can connect with Game Center, so you can share your iScab iPhone app prowess. 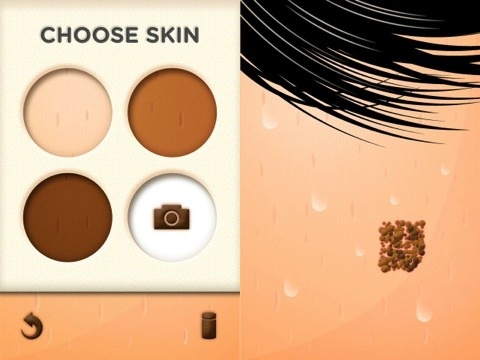 With the iScab iPhone app, you choose your skin. There are three tones–light, medium, and dark. Or, to be precise, you can shoot a photo of your skin. This function crashed the iScab app on a couple of tries, so I just chose one of the default skins. And, I found a scab to pick. With the iScab iPhone app, you swipe the screen to pick your scab. There are certainly places in the wound that appear worse than others. Pop-up directions warn you not to over-pick your scabs, as you’ll not earn as many points. So, you actually get points for scab-picking finesse in the form of accurate gesture controls. In time, the scab will form and you’ll be notified. You then pick away. Just like picking a scab, there’s only so much you can do. You have to let the scab heal and come back for more picking. My sons religiously check their Tiny Tower iPhone and iPod Touch apps to restock, assign jobs, and build floors on several occasions every day. I could not, however, entice them with the iScab iPhone, iPod Touch, and iPad app. Scabs in real life are epic. The iScab iPhone app is lame. AppSafari review of iScab was written by Jenni Ward on April 23rd, 2012 and categorized under App Store, Games, WTF. Page viewed 3979 times, 1 so far today. Need help on using these apps? Please read the Help Page.